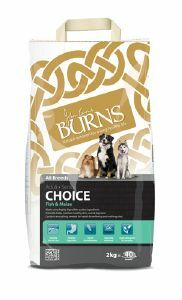 Burns Choice - fish & maize Suitable for adult & senior dogs. BENEFITS: Healthy skin & coat, Healthy digestion, Novel carbohydrate, Naturally Delicious, Hypo-Allergenic and Complete. Burns Choice is a complete, balanced, highly palatable quality food for adult and senior dogs of all breeds. It is ideal as a general maintenance food and contains all the essential nutrients your dog will need for lifelong health and vitality. Also suitable for the management of many dietary related health problems. Our Choice diets are made using only the finest, easily digested ingredients. We use only the highest quality sources of fish for protein along with whole grain maize which is a novel carbohydrate and an excellent source of omega 6 fatty acids. All Burns diets are formulated without ingredients which commonly cause food intolerance, such as wheat, soya, dairy, artificial colourings and artificial preservatives. Burns Choice diets naturally maintain healthy skin.